Typical pilot’s watch dial, with easy to read numbers. 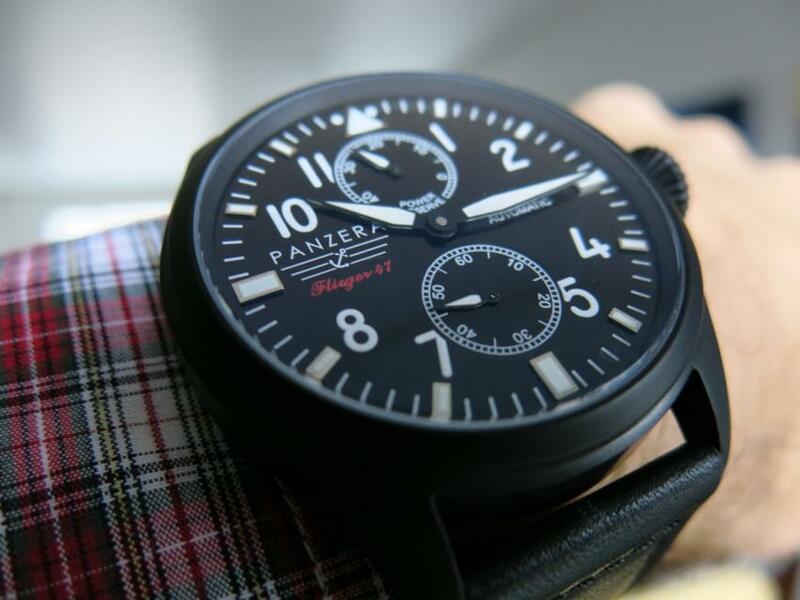 A few weeks ago we wrote a story about the Panzera Flieger 47. At that time, I was really impressed with the specs coming from the brand and I asked them to send me a watch to have a closer look at it. Keep reading to see if it stands up to their claim. When you get a watch, the first impression is always the box. In this case it’s a very elegant black leather box, with white stitching and with the Panzera logo debossed on the top. Inside, the box is cushioned with black velvet, while the watch is accompanied by a small instruction booklet and warranty card (12 months international warranty). The only thing I would suggest, is to make the little instruction booklet more detailed (talk about the Panzera brand, where the name comes from, etc.) and as a graphic designer I think more attention to the printing of the booklet, would make this packaging impeccable. UPDATE (July, 2014) – I just received in my mail the updated/improved Panzera booklet, with more details, better graphics and in three languages: English, French and Spanish. The matt finish of the case is very elegant, but not impervious to scratches. The case is built from stainless steel and covered with a matt black IP coating, resulting in a nice matt finish that highlights the dial even more. The power reserve indicator at 12 is a very useful feature on an automatic watch. 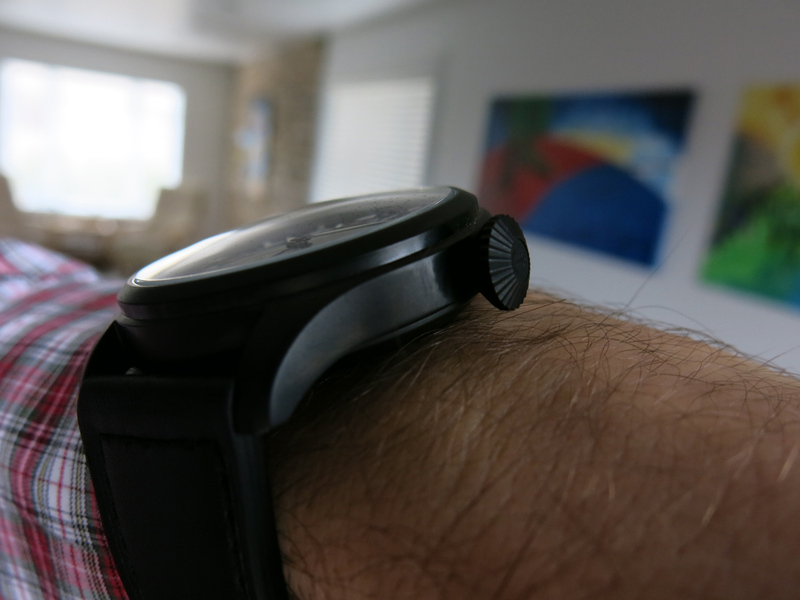 I love the size of the 47mm case even as I have a small wrist, it was comfortable and quite impressive in the same time, without being over-sized. The case is 13mm thick with a hardened mineral crystal dial. They nailed the proportions of the watch quite well with a timeless look, that some people might remind the iconic IWC Big Pilot or other pilot’s watches that cost multiple the price of this one. The big crown is another typical pilot’s watch feature. 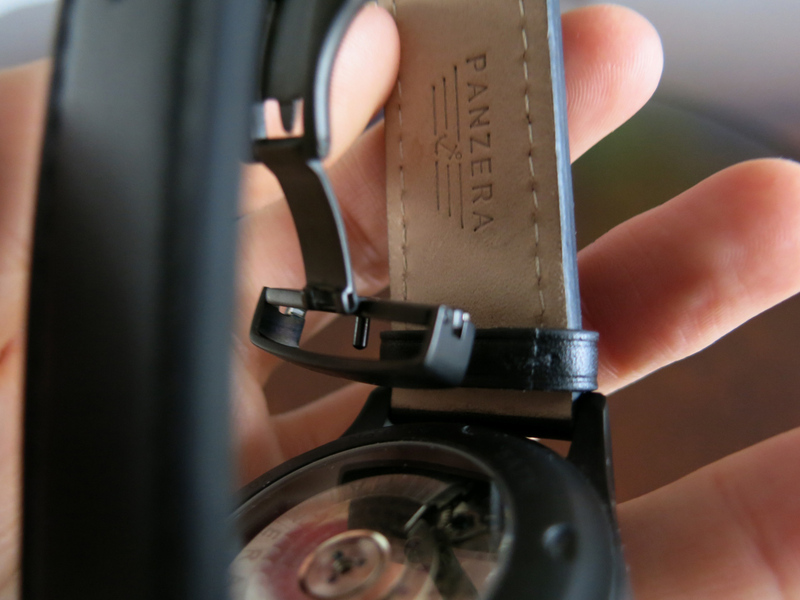 The crown has the same black coating as the case with the Panzera logo on it. It is very easy to handle and adjust even if you would wear a glove, a must for pilots of the past, but also handy for Canadians, like me. The engraved movement is visible trough the mineral glass window. The watch is powered by an Automatic P-2542-Calibre 2, which is actually a Sea-Gull 2542 Power reserve automatic. Some people might not like the idea of a Chinese movement, but you have to keep in mind that Sea-Gull is the largest watch movement manufacturer in the world and it powers most of the sub $500 automatic watches. 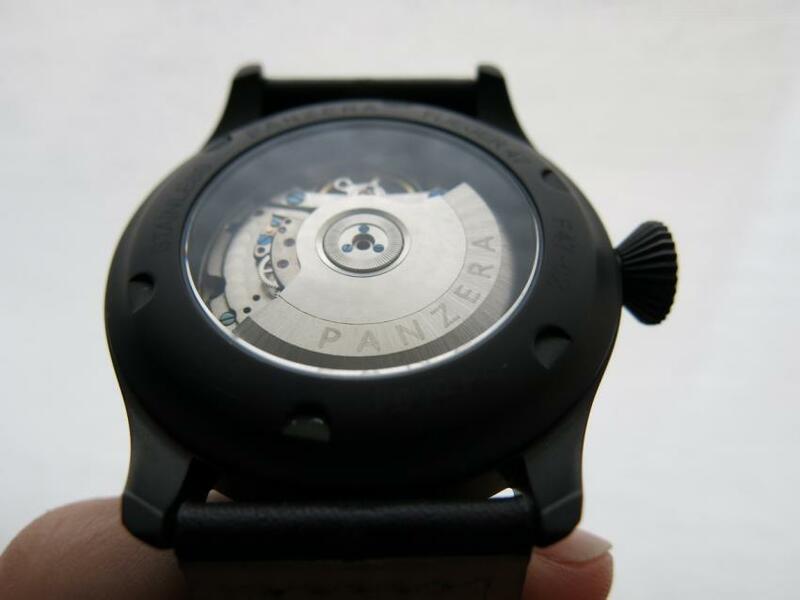 On top of this, Panzera watches are using the highest quality AAA graded movements, and not the A and AA that you would find in cheap watches. The push button deployment clasp is made of stainless steel and it has the same matt coating as the case. 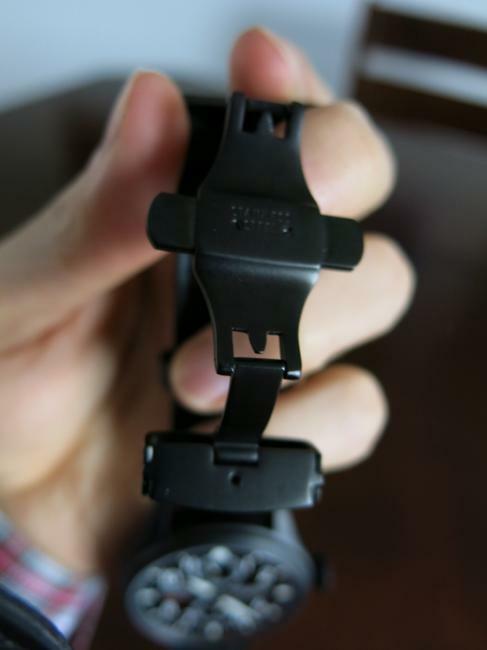 The deployment clasp has the Panzera name engraved on and it sits quite well on the wrist. 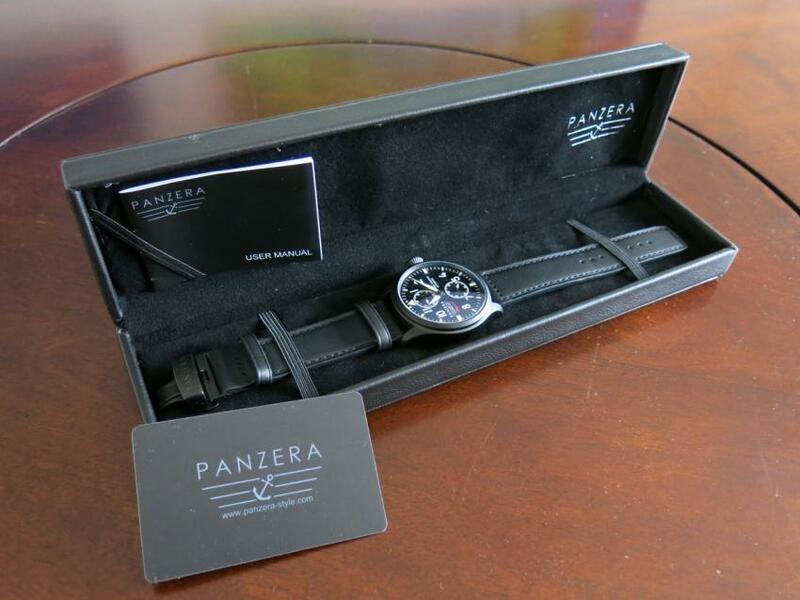 The calf leather strap is handmade and has the Panzera logo on it. The hand made black lather strap, with black stitching on the front has a nice thickness and it is a detail that definitely enhances the overall look of this timepiece. Panzera is a young brand that with it’s first collection, the Fliegers, is proposing a return to the traditional pilot watch design. I appreciated the attention to details of the manufacturer and the watch is for sure eye-catching — everyone I showed, loved its design and nice packaging. One of my friends who is close to retirement, really appreciated the visibility of the dial. This made me think that with the Baby Boomer generation entering their golden years, watch brands should propose more pilot’s watches. If I would buy a Panzera, I would probably go with the Flieger Arado, with a bare stainless steel case without any coating. As I wrote, I really like the matt finish on the Wolf, it makes you focus on the dial, but I’m a bit worried about the coating withstanding the punishments of everyday wear. 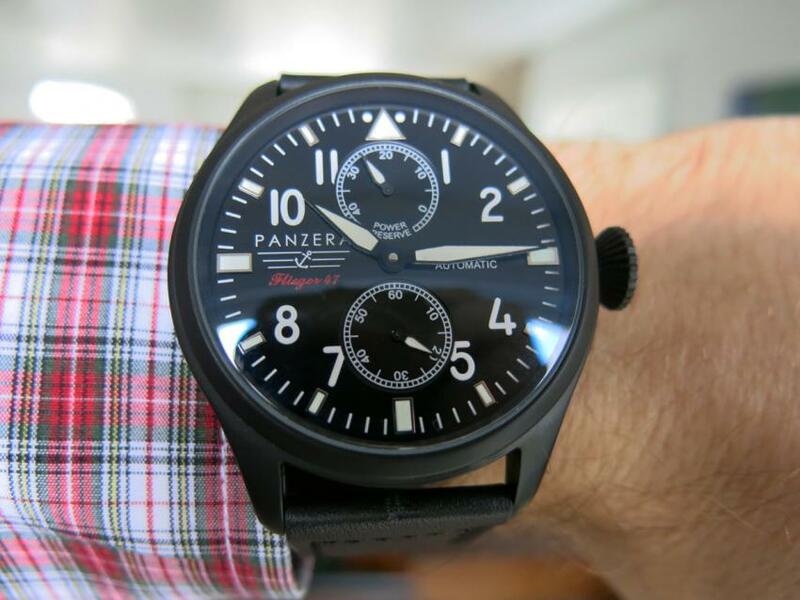 UPDATE: The Marketing and sales director at Panzera, reassured me, that the IP coating is very good and it was tested before the watch would be launched on the market. In 2012, a group of people were given Fliger 47’s to wear for 12 months and even as some of the watches came back quite dirty there were no signs of scratches visible with the naked eye. I would have loved to see maybe a different movement (Miyota, for example), that would discharge (the more or less found) arguments against the origin of this movement. I hope next time Panzera will opt for sapphire crystal instead of mineral crystal; even at this price range, I’ve seen budget watches with sapphire. 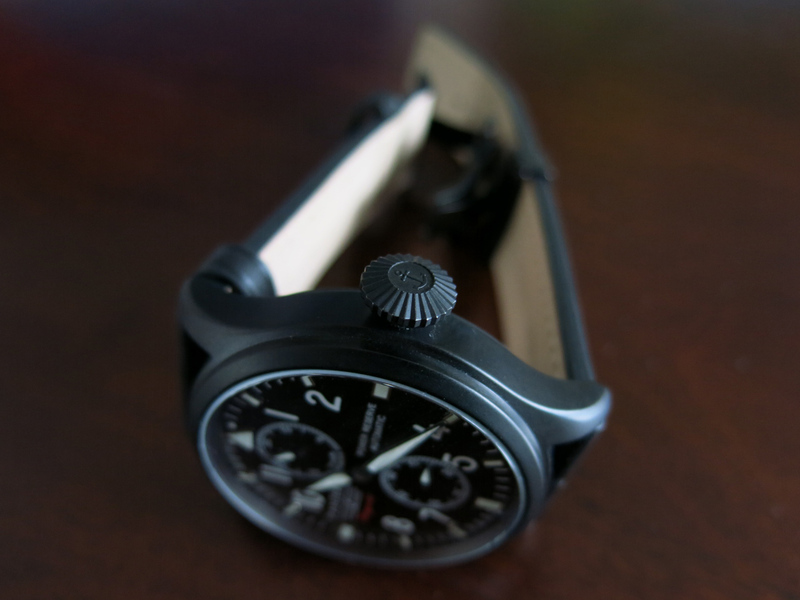 This watch was built for those that want to own a non-quartz pilot watch with a good look, nice packaging, while being very conservative with their budget. Considering the impressive packaging, I could imagine it as a nice gift for a loved one. At this point, there is no dealer carrying it in Canada, but you can order it online at panzerastyle.net. A Flieger 47 Wulf, will set you back € 325, which comes to approximately C$ 457, a good price for what you’ll get.